The equations of motion are differential equations. Such equations tell us how to calculate "what's happening now" from "what happened a little while ago." They're called differential because they have the form of ratios of differences (qua subtraction or differentiation or derivatives) between "what's happening now" and "what happened a little while ago." The process of solving the equations, that is, finding out "what's happening now," is integration, a kind of addition, which reverses the subtraction of differentiation. In computer simulation, we integrate numerically, but numerical integration is fraught with hazards. In this article, we give a stark illustration of a very simple differential equation going massively haywire under a very straightforward integration technique. 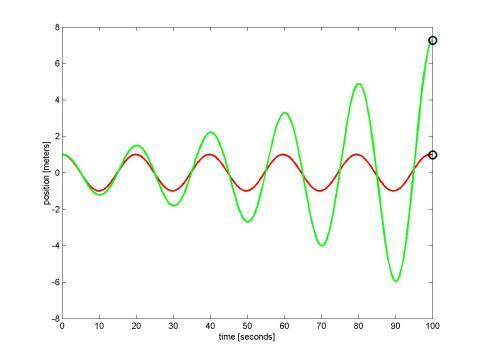 We also introduce MATLAB (from www.mathworks.com) as a programming, visualization, and design tool. The first term says "acceleration at time t = t2 is the ratio of the difference of the velocities at two times ("now," t2, and "a little while ago," t1), divided by the difference of the two times, calculated as we push the two times closer and closer." The velocity differences will get smaller and smaller, but the time differences will get smaller and smaller, too, so the ratio will, one hopes, converge to a certain number, and we call that number the acceleration. If the acceleration is large, the velocity will be changing quickly over short times, so the difference v(t2) - v(t1) will be large compared to t2 - t1. We gloss over lots of detail, here. If you need a refresher, let me suggest looking up "differential calculus" on www.britannica.com. We can see that "what's happening now," namely v(t2) depends on "what happened a little while ago," namely v(t1), and on mass m and force F. Likewise velocity is the rate of change of position, v = dx/dt. So, just as the velocity now depends on the velocity a little while ago through the acceleration, the position now depends on the position a little while ago through the velocity. We use two, linked, first-order differential equations to get position. Numerically, as in simulation, we cannot actually collapse the two times. That's only possible in a symbolic solution, also called exact, closed-form, or analytic. Rather, in a typical simulation setting, , the integration step size, will be set by the environment, often by a graphics rendering loop. At 30 frames per second, an acceptable minimum, will be about 33.3 milliseconds (msec) or 1/30 seconds. At 100 miles per hour, or 147 feet per second, a car will go about feet in that time. This means that with an integration step size of 33 msec, we can only predict the car's motion every five feet at typical racing speeds. This back-of-the-envelope calculation should make us a little nervous. To find out how bad things can get, we need an example that we can solve analytically so we can compare numerical solutions to the exact one. 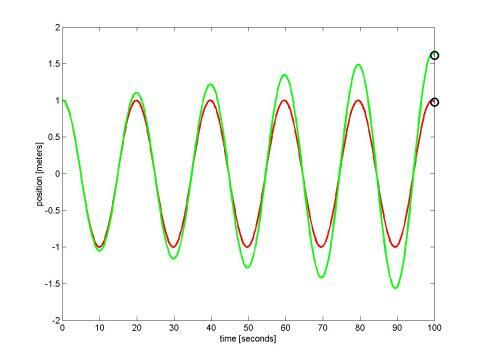 A whole car is far, far too complex to solve analytically, but we usually model many parts of a car as damped harmonic oscillators (DHOs), and a DHO can be solved exactly. So this sounds like a highly relevant and useful sample. The process for solving differential equations analytically is a massive topic of mathematical study. We showed one way to go about it in Part 14 of the Physics of Racing, but there are hundreds of ways. For this article, we'll just write down the solution and check it. 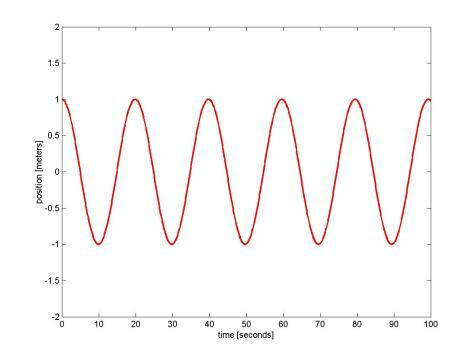 is the angular frequency in radians per second, or the reciprocal of the amount of time the oscillator's argument takes to complete 1 radian of a cycle. Since there are radians in a cycle, the period of the oscillator, or the amount of time to complete a cycle, is [seconds per cycle = radians per cycle/radians per second]. Let's plot a specific example with numbers picked out of a hat: m = 10kg, or about 98 Newtons or 22 lbs; k = 1 N/m. We expect the period to be or almost 20. The string '-r' means 'use a straight red line'. The only other notation that might not be obvious in the above is the argument of axis, namely [0, tn, -2 2]. This is an explicit or literal vector of limits for the axes on the plot. It's a little strange that the axis limits and the labels are specified after the plot command, but that's the way MATLAB works. Note that the missing comma between -2 and 2 is not a typo: commas are optional in this context. DISASTER! The numerical version is 60% larger than it should be at 100 seconds, and looks as though it will continue to grow without bound. What could be wrong? Let's look back at our approximate equations. The predicted velocity, , will be in error by and the position by . If no further errors creep in, what happens at the next step? so the velocity errors will eventually overwhelm as grows. What is to be done? The answer is to use a different numerical integration scheme, one that samples more points in the interval and detects curvature in the solution. The fundamental source of error growth in the Euler scheme is that it is a linear approximation: the next value depends linearly on the derivative and the time step. But it is visually obvious that the solution function is curving and that a linear approximation will overshoot the curves. In the following plot, we show the results of running the code above with changed to 0.4 from 0.1, showing how the errors in euler accumulate much faster over the same time span (we also adjusted the axis limits for the larger errors). The most important thing to notice here is how the Runge-Kutta solution remains completely stable and visually indistinguishable from the exact solution while the Euler method goes completely mad.